An air of surprise surrounded the visit of Israeli Prime Minister Benjamin Netanyahu to meet with his Russian counterpart President Vladimir Putin five days before an Israeli general election. Of course a photo opportunity and being warmly received by an important world leader is a splendid thing in the context of a political campaign, certainly when so many Russian speaking citizens of Israel view that relationship in such positive terms. But there was speculation that possibly something more dramatic or urgent could be on the agenda - could there be important new developments in Syria to discuss, could the reports of new Iranian basing arrangements in Syria have triggered the need for an urgent exchange? There was even speculation that the visit might be linked to the recognition from the previous week by US President Donald Trump of Israeli sovereignty over the Golan Heights - that was particularly unlikely given that Russia’s position on the Golan has been made very clear and was not about to change. To those in the know of course the reason for the visit was not a surprise at all, and to the rest of us the picture soon became clear. Friday is the day of the big weekend newspapers in Israel, and this is the last weekend before the general election on Tuesday April 9th. To control the news cycle over the weekend before the election in a system like Israel’s is a very useful advantage to have, and Benjamin Netanyahu pulled off a veritable coup de grace that is dominating the news cycle by securing the return of the remains of Zachary Baumel, an Israeli soldier killed in the Battle of Sultan Yacoub during the 1982 war in Lebanon. His remains were recovered by Russian special forces troops in Syria. The episode was kept secret while the remains were verified. The issues on the agenda between Israel and Russia and worthy of being discussed between Russian President Putin and Prime Minister Netanyahu are many. The Iranian involvement in Syria and the continued Iranian attempts to transfer improved weapons to Hezbollah; Iranian efforts to reach the Israeli border with units of Shiite fighters; the transfer of S-300 missiles for use by the Syrian army, and more. In Moscow there was a military ceremony while the personal effects of the soldier were returned, and Netanyahu was able to sit with Russian President Putin and talk in Hebrew about the mission that had led to the recovery of the remains of the lost soldier, and to expound on the importance of his personal friendship with Russia’s leader. President Putin reciprocated with his own expression of the importance of this humanitarian gesture. In fact in Israel there are restrictions placed in the media in the period immediately preceding an election where newscasts cannot broadcast what is deemed to be election propaganda. It is then quite a challenge to generate a news story under those circumstances - but with the Israeli military swinging behind Netanyahu's interpretation of this not being electioneering, Netanyahu was able to bask in the glow of positive headlines. The pictures of the military ceremony with Russian defense leaders looked all the more remarkable given that it has only been six months since Israel had been blamed for the downing of a Russian Ilyushin military aircraft over Syria as a result of Israeli air manoeuvres at the time. 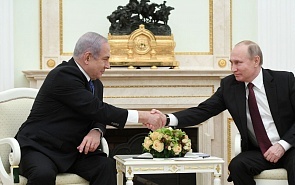 Netanyahu could also point to having reset that important relationship with the Russian military. There were certainly other issues for the leaders to discuss, not least the ongoing tensions in Syria including with the withdrawal of the major part of America’s military presence there being evermore real and evermore imminent. The escalation in Gaza would also merit being on the agenda, with Russia maintaining its own important channels to the Hamas leadership. Unlike the US, Russia maintains a dialogue with all sides of these various conflicts - Israel and Hamas for instance, as well as Israel and the Syrian leadership, Iran and Turkey. But for Netanyahu this visit was all about the short term gains. The last pre-election polls in Israel suggest a very close and perhaps unpredictable race between Netanyahu and his coalition allies on the one side, and the Blue and White party of General Benny Gantz together with the clear opposition to Netanyahu. It seems that this will be a fight for every vote and one that is not only likely to determine whether Netanyahu remains in government, but very possibly whether he remains a free man or spends an extended period behind prison bars. So the stakes are high. The Moscow visit is all the more potent an electoral asset given the over one million Israelis whose roots are in the former Soviet Union and many of whom still look to Russia as an important part of their identity, and many of whom view Putin particularly positively. For President Putin, one imagines this was a rather longer term investment. If Netanyahu is returned as Prime Minister then one of America’s closest allies will be heavily indebted to Moscow. It is conceivable that could be of help directly on the US-Russia track, but it will almost certainly be of potential value as the next phase of Syria and a possible endgame in Syria comes into sight, with America largely withdrawing and with Israel in a position to spoil or facilitate the kind of settlement that could be in Russia’s interest. So a win-win, clearly for Russia, and while not necessarily for the state of Israel, certainly for the interests of one Israeli - Benjamin Netanyahu.